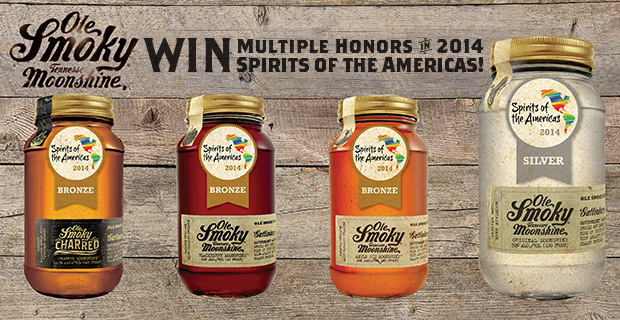 Gatlinburg, TN (April 17, 2014) -- Ole Smoky® Tennessee Moonshine is delighted to announce that they have been recognized with multiple honors in the 2014 Spirits of the Americas competition. The independently owned distillery out of Gatlinburg received the following distinctions: Ole Smoky’s Original Moonshine won the silver medal in its category while Ole Smoky Blackberry Moonshine™, Apple Pie Moonshine™ and their newest flavor, Charred Moonshine™ won bronze medals. The Spirits of the Americas held its 2nd Annual Spirits of the Americas Tasting Competition on March 31 and April 1. This year’s essential role of judging included a blind tasting, consisting of a panel of fully experienced and qualified industry judges. All the spirits were judged on a 100-point basis, concentrating on appearance, aromatics, flavor, mouthfeel and finish. This year, for the first time, Silver medal winners will be published in the May issue of next month’s Tasting Panel. Ole Smoky is the leading distiller of premium moonshine in the U.S. and the first federally licensed distillery in the history of East Tennessee. The company’s roots can be traced to the early settlers of the Smoky Mountains, where they refined the art of whiskey making in order to survive during tough economic times. When Tennessee state law changed in 2009, allowing the licensed production of whiskey and other spirits across new counties, a group of local families saw an opportunity to showcase the art of superior, mountain-made moonshine. About Ole Smoky®Tennessee Moonshine®Currently, Ole Smoky Tennessee Moonshine nationally retails ten flavors of moonshine made using authentic East Tennessee recipes, jarred and shipped directly from the company’s famed Gatlinburg distillery. The Ole Smoky Moonshine™ distillery, known as The Holler, is America’s most visited distillery and produces the brand’s signature flavors. Original Moonshine, White Lightnin’™, Moonshine Cherries™, Peach Moonshine™, Apple Pie Moonshine™, Blackberry Moonshine™, Strawberry Moonshine™, Lemon Drop Moonshine™ and Charred Moonshine™ are available selectively in 49 states and Canada. Pineapple Moonshine™ is available in Tennessee, California and Hawaii only. Ole Smoky Tennessee Moonshine can be found at local retailers and is sampled and sold at some of the biggest music and sporting events in the country. True to its roots, each Ole Smoky Moonshine flavor is born from the hand-crafted recipes of the Tennessee families who have been filling moonshine jars and jugs in the Smoky Mountains for more than a century. For more information about the brand, please visit www.olesmokymoonshine.com.